A judge sentenced a woman in her twenties to jail for selling tickets to famous K-pop stars’ concerts but would take the money and not deliver the goods. Judge Song Joong-ho of the Busan District Court sentenced a 23-year old woman, referred to as Ms. A, to serve a ten-month prison sentence. Her indictment comes after a months-long K-pop ticketing scheme. 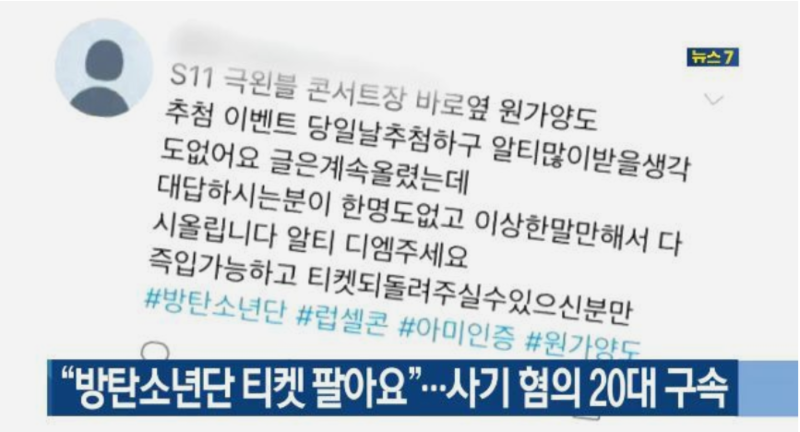 Starting in December 2017 until June 2018, Ms. A posted messages on different bulletin boards advertising concert and event tickets for some of K-pop’s largest stars including Shinhwa, EXO, and BTS. Ms. A would set up sales and receive payment, but failed to deliver the advertised tickets. According to court documents, she would cut contact with the victims after collecting as much as 440,000 KRW (393 USD). Moreover, the victims were not restricted to Korea, but also foreigners who visited the country to attend K-pop events. Amazingly, over the course of seven months, the criminal pulled off the scheme 63 times and accumulated around 11.14 million KRW (roughly 9,900 USD) in illegal profits. “Although the number and duration of victims and crimes are significant, Mr. A has not paid any compensation,” Judge Song said during the sentencing. Adding that “Victims, both Korean and foreign, have filed a claim seeking to punish her.” Further, the Judge determined that this was not done for survival, but for personal profit. Ms. A bought purses, wallets, cosmetics, and more with the money she stole from K-pop fans.